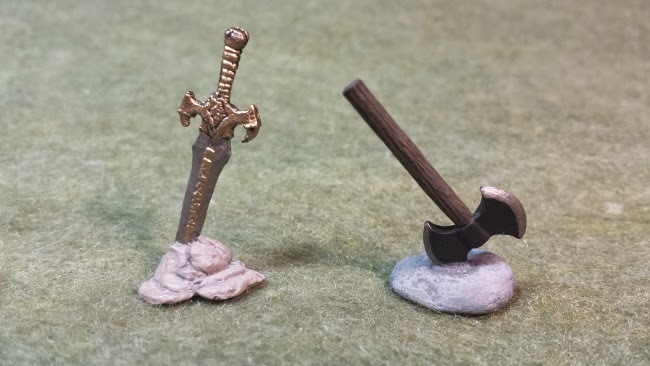 In JADE's Maze of the Minotaur game, the barbarian brothers Robert and Raymond E. Howard often drop their swords. Robert regularly drops his blade to engage in unarmed combat, and of course, anyone can have their weapon torn from their hand. So that we don't forget where our weapons fell and subsequently lose them, I made these weapon markers. The sword is from a Reaper Familiar Pack. I carefully cut and filed the crow on the blade off, leaving just the sword. 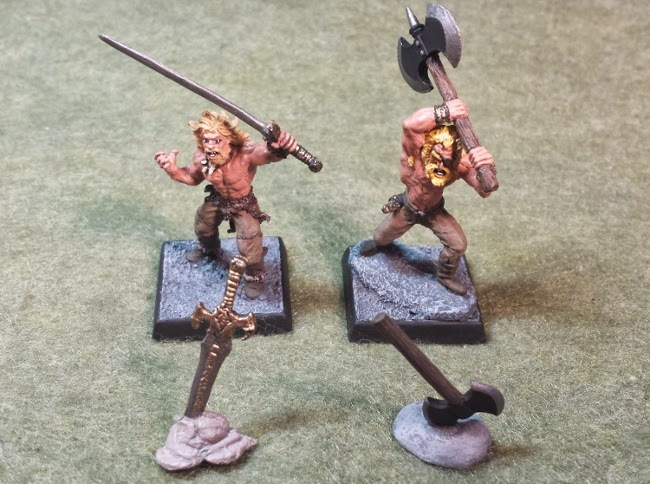 The Axe is a from a pack of 28mm weapons I purchased from somewhere... It was years ago: before JADE. The stone the axe is in is just a lump of green stuff. They should help our barbarians keep track of their blades, while still looking cool on the field!